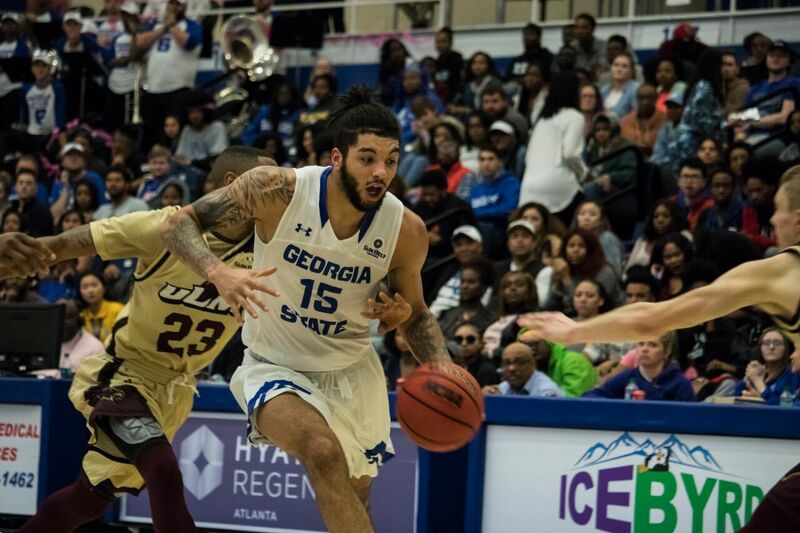 The Georgia State Panthers’ losing streak is now extended to two as they lost on Thursday night in the GSU Sports Arena against the Troy Trojans 83-70. With the loss, the Panthers’ record is 20-10, 11-6 in the Sun Belt Conference. Meanwhile, the Trojans are 15-15, 9-8 in the Sun Belt Conference. The Panthers’ star, D’Marcus Simonds, had a game-high 27 points. However, the Panthers suffered a mental breakdown as they held a 42-38- point lead at halftime and failed to remain efficient on both sides of the ball during the second half. Troy has not only swept Georgia State this season, but they also have four of the past five games against the Panthers. Nonetheless, the Panthers still have the advantage in the overall series between the two teams (22-20). The Panthers began the game applying pressure on the Trojans’ defense by allowing Simonds to take control of the game with aggressive drives to the basket which ultimately forced the Trojans to have to clog the lane. What happened next? The Panthers were able to get clean looks from three, where they are the most effective. Simonds surprisingly shot 3-5 from three in the first half. Junior Devin Mitchell made two threes, and senior Isaiah Williams knocked down a three-pointer in the first half to help the Panthers shoot 50 percent from beyond the arc in the first half. The second half was where the Panthers collapsed. Usually, coach Hunter receives a significant contribution from Malik Benlevi, Jeff Thomas, and Williams. But outside of Simonds, the Panthers failed to get substantial contributions from their significant role players. To begin the second half, the Panthers allowed the Trojans to exploit their defense and go on a 14-2 run. Many would argue Hunter should have called a timeout when Troy made back-to-back three-pointers to open the half. The Panthers’ Achilles heel all season has been allowing opponents to make threes against their zone defense — corner threes. The same was the case in the second half. Troy finished the game shooting 46 percent from three. They also outhustled the Panthers with 10 second-chance points compared to just five for the Panthers. Georgia State must quickly regroup and turn their focus to South Alabama. The Jaguars beat the Panthers in their first Sun Belt Conference game of the season on Dec. 29 (86-64). With Saturday being senior day for Georgia State, it will be an emotional game for Williams and senior Jordan Session. The Panthers are much more talented than the Jaguars, so they should be able to secure a victory for the two seniors on the team. However, if they face a mental lapse such as the one they experienced during the first matchup between the two teams, the Panthers can find themselves on a three-game losing skid heading into the Sun Belt tournament.